We all want to improve our health. We want to have the energy to do the things that really matter to us, we want to live for a long time, not suffer from illness over the duration of our one big beautiful life. We all want our bodies to feel healthy and strong. So why aren’t we healthier? We’re busy. We spend hours at work, we feed our families, we do laundry, we clean our homes. If you’ve ever felt maxed out, you may wonder how you have the time (or the money) to focus on your health. Something I know about the healthiest and smartest people in this world. They take time to nurture. They also take time to read. To sit, continue to educate themselves and feed their mind. If you’re tired of floundering in your journey to better health, and searching for the best resources to make it easier, I’ve partnered with Ultimate Bundles to bring you something that’s going to rock your world. It’s called the Ultimate Healthy Living Bundle. This bundle is packed with over 100 (107, to be precise!) eBooks, eCourses, printables, and even a membership site and online summit, that cover everything you could possibly want to know about healthy living. Build your own pantry of healthy, convenience foods. The combined value of all the training in the bundle is over $3,680, but for the next 5 days, you can get EVERYTHING for 99% off! And here’s the crazy promise: If you find this isn’t right for you, Ultimate Bundles will give you ALL your money back. Seriously. You have 30 days to test out $3,680 of training with absolutely NO risk of losing your $29.97. To learn more click here and get the entire bundle for only $29.97. 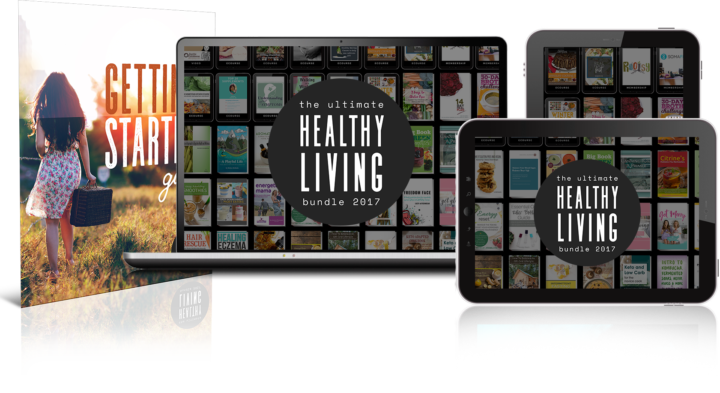 If you want the full life that being healthy can bring you, you owe it to yourself to check out the Ultimate Healthy Living Bundle. If you’re worried you won’t know where to start with 107 different resources to choose from, the team has you covered there too! (hella year – simpler not harder!) Inside you’ll find a handy ‘Getting Started Guide’ so you can quickly locate the eBooks and eCourses that are perfect for you, wherever you are in your healthy living journey. We’ve done the work for you! So simple and SO GOOD!